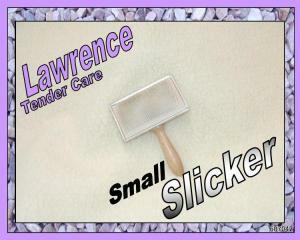 The Lawrence Tender Care Slicker Brushes are specially designed for gentle grooming even on the most delicate of coats. All Lawrence Slickers are hand crafted from the finest raw materials. The secret is the lightweight aluminum construction, extra fine wire bristles set in a soft foam cushion to provide comfortable brushing while preventing brush burn. The Slickers are ideal for use on dogs with fine coats, older dogs, puppies, and even useful for grooming around the faces and delicate parts of larger breeds. The Tender Care Slickers come in three sizes; Large, Medium, and Small. These slickers are made in England.